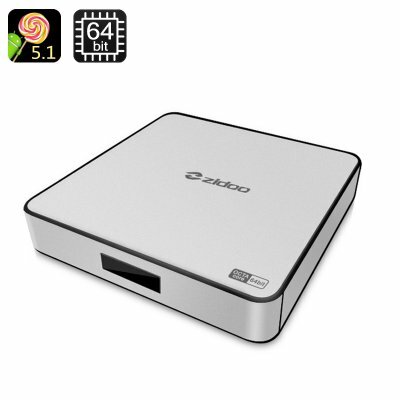 Successfully Added ZIDOO X6 Pro Android TV Box - Android 5.1, Cortex-A53 RockchipOcta Core CPU, 4Kx2K, Wi-FI, Bluetooth 4.0, KODI, HDMI to your Shopping Cart. The ZIDOO X6 Pro is a compact and beautifully-designed Android TV box packing a great set of features and the latest Android OS. The small gadget will turn your living room into a first-class entertainment centre, complete with access to the latest movies, TV series and games. With the ZIDOO X6 Pro, you get to experience the latest upgrades of the Android OS. Android 5.1 comes with a number of functional and design improvements and is sure to take your user experience to a new high. Thanks to the built-in dual band Wi-Fi, you will enjoy super fast web speeds and steady connection – great for making the best of your favourite streaming channels. With Bluetooth 4.0, you will also be able to easily hook up a number of other devices to the TV box with no cables cluttering your TV stand. Moreover, with the support of 4K resolution, your media will look its best on the large screen and you will be ready for the 4K revolution. To make sure you have your entertainment system ready right out of the box, the ZIDOO X6 Pro comes with KODI version 14.2 (also know as XBMC) pre-installed so that you can get started right away. The Cortex-A53 Rockchip 3368 octa core CPU is the true highlight of the TV box. The 64 bit processor will not only guarantee smooth and fast performance, but will also let you work with the latest tools and applications. With the future-proof CPU, there’ll be no limits when it comes to your media needs, games or multitasking. Feel free to store your selected media right on the TV box. The ZIDOO X6 Pro comes with 16GB of internal memory and you can add to that 32GB with the use of an SD card. The ZIDOO X6 Pro Android TV Box comes with 12 months warranty. Brought to you by the leader in electronic devices as well as wholesale Android TV boxes, Chinavasion..